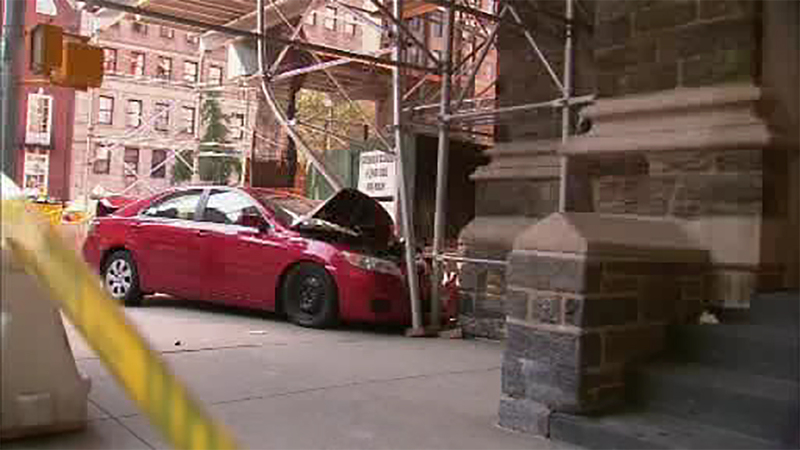 UPPER EAST SIDE, Manhattan (WABC) -- Three people were hurt in an accident that sent a car onto a sidewalk on the Upper East Side Saturday morning. The accident happened at about 8:30 a.m. at Park Avenue and East 85th Street. Police say two cars collided, and one went onto the sidewalk, then ran into a scaffolding. One person was seriously injured, while two others sustained minor injuries. The driver of a red car collided with a taxi as a fire truck approached with its sirens on, said witness Yancy Matos. "She had the green light so she didn't know what to do, she probably didn't see the cab because the cab was making a U-turn so quick. She didn't have time to brake, she just hit the cab and lost control and went into the sidewalk," said Matos. The structural integrity of the scaffolding will be checked.